This client has experience using the IFS process to work with her eating issues. 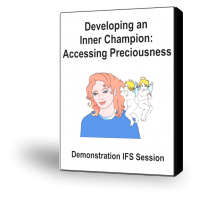 In this touching session she begins by bringing in her higher self to help her know when she is finished eating a meal. She recognizes that her Indulger’s eating was the only way that she could comfort herself in a childhood filled with tension and pressure. On the other side of the polarization she explores the Controller’s belief that without it she would be a “bag lady,” and appreciates how it has pushed her to achieve all her life.. She is able to retrieve the protected exile and care for it by creating an atmosphere without any expectations. She asks the question “How can we live from right action without using the controller to push us”, and we discuss the function of bringing in qualities and capacities of Self to guide our actions.